In this episode, Ben will share “Awake” from 2 Peter 3 in our CMOW segment. Then, Andrew and Taylor have a great interview with Gabe Cleator on the importance of Biblical Meditation. All that and more, in this Episode of the Sharpening Character Podcast! Ben is going to be talking about how we as Christians need to AWAKE, as Christ is coming, and there will soon be a time when it will be to late to win others to Christ. 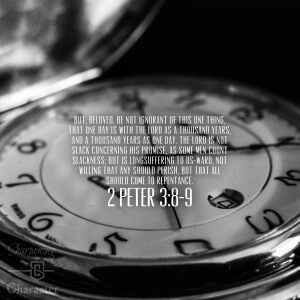 2 Peter 3:8-9. Download it here! Great episode guys! It is was a blessing to hear from Gabe. Gabe’s enthusiasm for God’s word is an inspiration to me. 9 Wherewithal shall a young man cleanse his way? by taking heed thereto according to thy word. 10 With my whole heart have I sought thee: O let me not wander from thy commandments. 11 Thy word have I hid in mine heart, that I might not sin against thee. 12 Blessed art thou, O LORD: teach me thy statutes. 13 With my lips have I declared all the judgments of thy mouth. 14 I have rejoiced in the way of thy testimonies, as much as in all riches. 15 I will meditate in thy precepts, and have respect unto thy ways. 16 I will delight myself in thy statutes: I will not forget thy word. Gabe quoted verse eleven, but to read the whole passage is even more powerful, and really goes along with the theme.